When I came over to the Netherlands almost ten months ago for work, I couldn’t in my wildest dreams imagine that finding a good old cuppa would be my main concern. I have by now given in to buying my tea when back in the UK, or to pay extortionate prices in speciality deli’s in Amsterdam. Imagine my surprise when realizing that having tea when out and about town is equally impossible. I gave up trying, and have now started to appreciate (at times, at least) the fresh mint tea they serve everywhere. Though not as good as in the Big Mosque in Paris, it is generally fresh and invigorating, just like it should be. 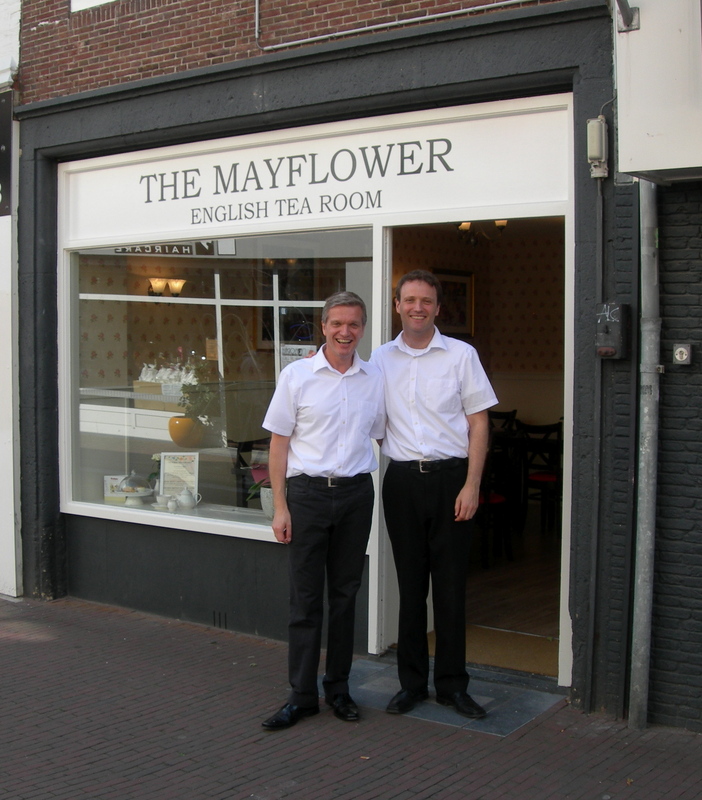 But now, finally, to tweak up the general standard of tea drinking in the Low Countries to a higher level, a real English tea room called The Mayflower English Tea Room has opened in Amersfoort, a 40 minute train ride from Amsterdam Central Station. I’ve now been twice, and good Lord is it a relief for a semi-expat like myself! Beats the high tea I had at that-very-fancy-hotel at 15 Beeston Place, London, last year with a mile, or two, which says alot about the love and effort put in to this establishment by the English owner, Jeremy. And all that effort and love shines right through everything that’s served. To start with, I want to give The Mayflower a huge round of applause that everything is home made. None of that cheap, pre-packed rubbish you get at lesser establishments. Everything is made in the newly equipped kitchen at the back of the tea room. All is baked, decorated, fluffed up and smiled at by the owner himself. How about that for a recipe for success in 2011? The artisan and organic food movement has not reached over here in the same way as it has the British Isles, but I hope this can be a prime example that non-prefab is to prefer above everything else when it comes to food. It might all be home baked, but still the prices are very resonable. 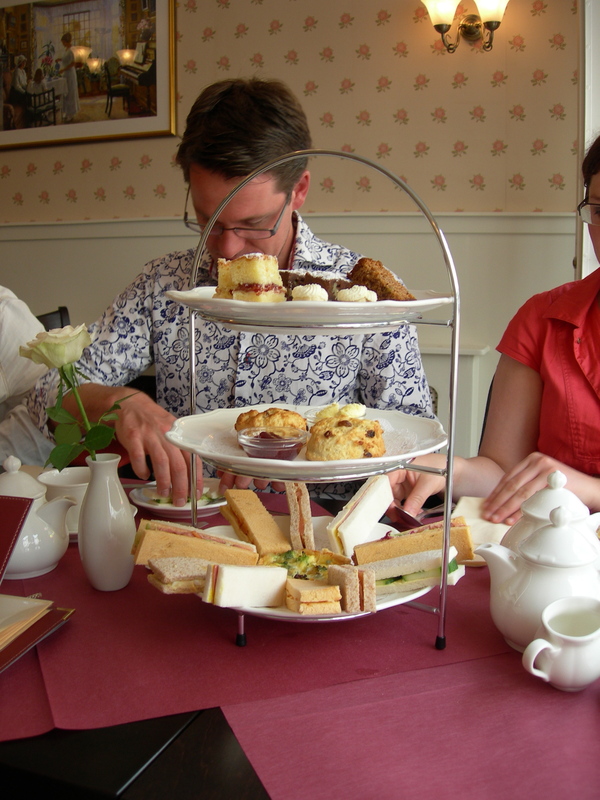 €18.50 for a full High Tea incl. 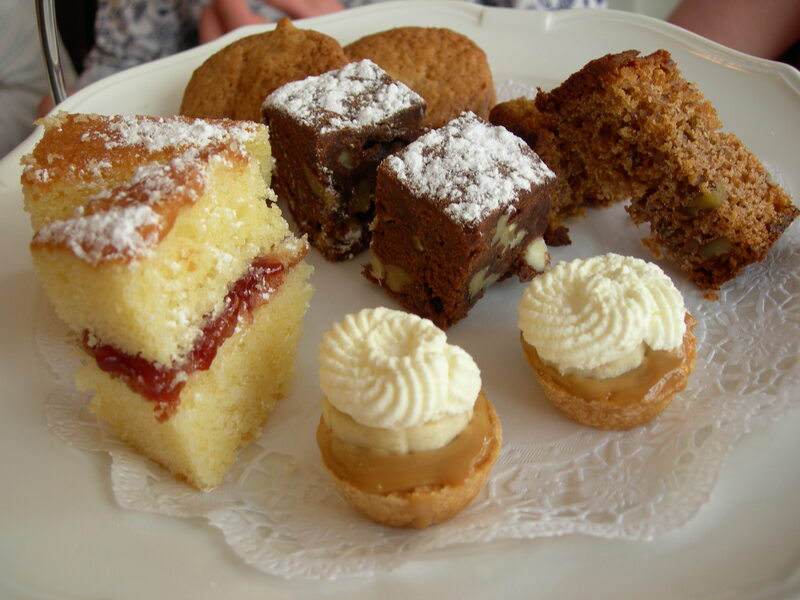 finger sandwishes, scones with all condiments expected, stunning pastries (as you can see above) and a pot of tea. “Surely not?” you may say, but that’s how it is. Light on the pocket and fills you up like a Sunday roast. I have so far managed to try four (!) of the teas served, three black and a green/herbal Moroccan Mint. As is tradition at an English Tea Room only loos leaf tea is served, and if you find it too strong just ask for some hot water on the side. Also, milk is to be had if required, so no blank gaze will meet your eyes from behind the counter if you would ask for it like at most café’s in this paradise of cloggs, windmills and tulips. 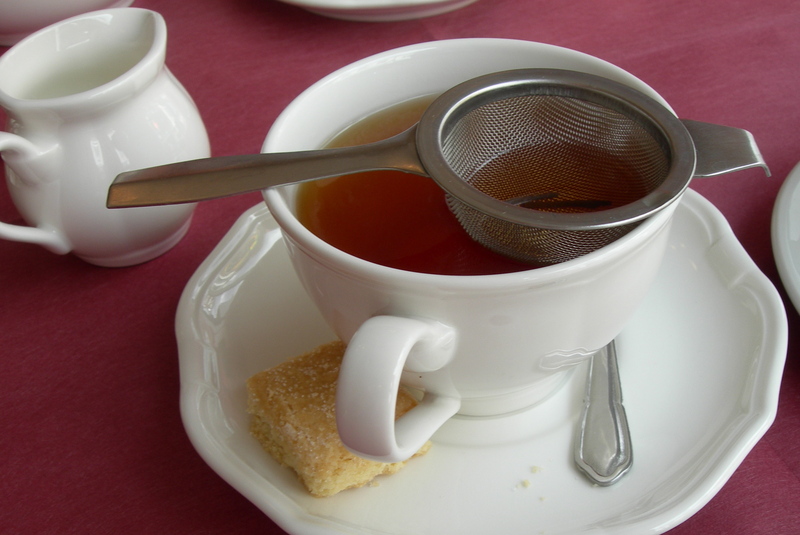 The providers of the tea, Harney & Sons, have been in the business of so called “gourmet teas” for over twenty-five years and the result can be seen in these pure tasting blends with kept depth and lack of bitterness though stewed in the pot if left too long. Brilliant choise and a joy to drink. For those who abjure the classic tea tradition, there is also coffee on Lavazza beans, so every taste is catered for. 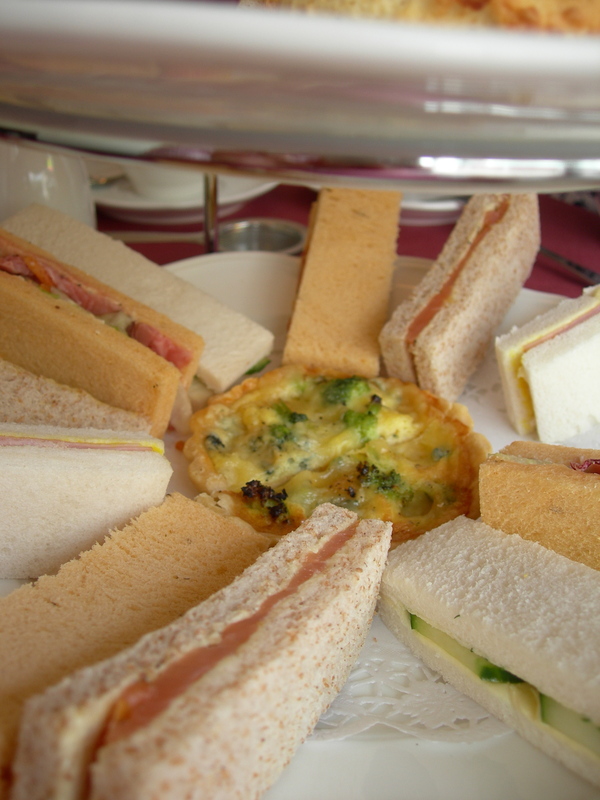 The finger sandwiches with varying, typical English fillings like roastbeef and horseradish, tomato chutney and cheddar, cucumber and dill are splendid small representations of the English tradition. No more, no less. Fresh and wonderfully tasty. What else is there to ask for? The home made fruit scones also matches the expectations with being light and on the right side of sweet while at the same time not tasting of baking powder, as is always a risk. I understand they have experimented a lot to find the perfect recipe, and it has payed off and shows. The scones, jam and the clotted cream married perfectly and transported me back to the Cornish coast like was I wrapped up in a whirl of English summery breeze. Amazing, pure and simple. The top of the tiered cake stand is filled with yummy goodiness too. My favourite is still, like it was at my first visit, the Victoria sponge. Just like with the scones there was this enviable lightness to the cake, like biting into a cloud. Not that I ever have, but if I did I imagine the feeling would be similar. The small exquisite banoffee pie were also very impressive. I promise you that all these pastries, cakes and sandwiches will fullfill your every expectation of what a real High Tea is like. And oh, I almost forgot to mention the blue Stilton cheese and broccoli quiche that you get with the sandwiches on the bottom tier. It’s delicious too. But you probably figured that out already. My overall impression of The Mayflower is that the owner, Jeremy Roberts, is on the path towards recognition for his efforts and success will come running his way. With the incredibly high standards set and the effort put in to this business I have a feeling that when word gets around, not only in Amersfoort, will he be very busy indeed. The attention to detail (see the William Morris wallpaper in the background?) and the engagement and love for authenticity can’t be missed and will be appreciated by customers. And most importantly, the food and the customer, be it a family with babies, a business man in a hurry or an elderly couple, is put first. All this shows from the second you walk through the door. If you’re looking for a little bit of England abroad, this is where you have to go. You will love every bite and cherish every sip when you’re there, and thank your lucky star that someone planted this little haven of Britishness in the heart of the Netherlands.